Dental implants have many advantages over removable dental restorations. The are many benefits getting dental implants. Some are short term and others strengthen your smile for the long haul. Whichever way you look at it, the permanence of dental implants makes them a cost-effective way to improve your smile, which is an investment worth making! If you have removable dental restorations, you might not be getting all the bite strength you could have with implant-supported dental restorations. The increased bite stability and strength that comes with dental implants greatly improves your bite power. Slippage while biting and chewing is a thing of the past. Missing teeth have a strong impact on your appearance and self-confidence. When your mouth is closed a few missing teeth can alter the shape of your face. With dental implants, you no longer have to live with the inconvenience and embarrassment of gaps in your smile and cheeks that have sunken in. Dental implants can restore your feelings of positive self-esteem and bring back a spring in your step. Are you having difficulty chewing? Missing teeth hamper your ability to bite and chew in a normal fashion. Dental implants allow you to enjoy a healthier diet with a wider variety of foods. Your eating functionality will return and you can begin enjoying most of the favorite foods you’ve always loved! If you are embarrassed to open your mouth because you mumble and slur, dental implants will help you speak with confidence. Missing teeth do affect your speech, and with implants, you can return to speaking clearly and eliminating unnecessary slurring. Missing teeth have a serious impact on your health. Dental implants prevent future tooth and bone density loss while maintaining a full, permanent set of teeth. When you are missing a tooth, the gums in the neighboring area around the gap start to recede and the bone weakens. 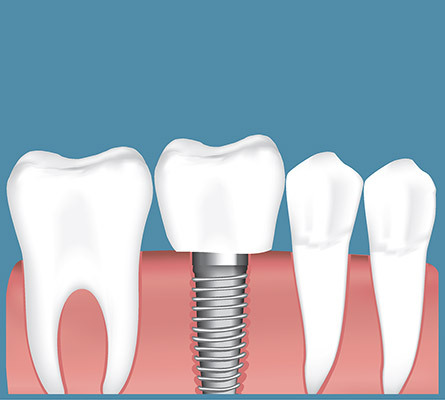 Dental implants prevent bone loss and deterioration while supporting bone structure and preserving bone mass. They keep your jaw stronger because they are fixed to the jawbone itself. Implants act as if they were natural teeth roots providing a secure connection between your gums and crowns, bridges, and dentures. Dental implants function just like natural tooth roots. This offers a number of dental health advantages. For one, your bite strength with dental restorations will be comparable to your bite strength with your natural teeth. In addition, there is added stability with dental implants compared to removable dental restorations. And since the dental implants function just like natural roots, bone loss and gum recession as a result of missing root structure is eliminated. Implants can last for decades with proper home care and professional maintenance. Permanently placed teeth are healthier for your other teeth by increasing the stability of dental restorations. Your dental implants will become a durable part of your smile. There is no risk of implants slipping out of place regardless of if you are laughing, speaking, or even just yawning. You’ll find the enhanced stability and security for your dental bridges, dentures, and individual dental crowns make implants the strongest form of teeth repair. People who wear dentures know all too well the annoyances that come with adhesive dentures. Adhesive dentures constantly slip, click, and perform at under 25% eating proficiency. Not to mention the constant readjustments associated with a receding jawline. With implant supported dentures, denture wearers get results they might not know were possible. Frequent denture slippage is eliminated by holding them in place with a post embedded in the jawline. Dental implants put an end to irritated gums while eliminating slippage. Bite strength is increased greatly allowing you to eat the favorite foods you used to enjoy. Take the first step and improve your smile and confidence by setting up a free consultation. Join the others in the Traverse City area who are enjoying a full set of healthy teeth. Contact us today!